At the Church of St John the Divine, where my husband is the organist, we are running a series of Lenten Concerts on Sundays throughout March. These events are short recitals (approximately 45 mins) and the entry is by donation. We hope these to be the kind of events that bring in people also other than the most regular concert-goers. The length or cost should not be an issue here – even if you are not sure whether you like it or not, it is not going to be a big investment of your time or means. Plus St John’s Church is a beautiful place, and outside service times the church doors are shut, so these concerts are also good opportunities for people to walk in from the street, and enjoy the church with some lovely music for three quarters of an hour, with a cup of coffee or tea, which is also provided in these concerts. The first concert of the series this year was a somewhat unconventional combination: just two baroque flutes and no other instruments. I played this programme with my Argentinian colleague Carolina Perez Bergliaffa from Vancouver. There is so much wonderful repertoire out there for two flutes, and playing duets with someone on the same instrument as yours always feels very special and intimate. I also ended up talking to the audience quite a bit between the pieces, to give them some background on how baroque flute was newly-discovered and a popular instrument in the 18th century, and how playing flute duets was one way of re-creating your favourite music at home, especially since no record players or iPods were available back then. We got an audience of quite a mixed crowd – from devoted early music lovers to some people who just happened to walk past the church and see the sign about the concert outside–but all the feed-back we heard was very positive. The comments made me think that perhaps there is a lot more room for alternative concert models–perhaps concerts that are shorter and more intimate in setting. You can find out more about St John’s Lenten Concert Series here, -the next one I am playing in is on March 25th, a programme of Baroque Arias for soprano, flute and continuo, including the gorgeous “Aus Liebe” from Bach’s St Matthew Passion, and “Ich folge dir” from St John Passion. And on April 1st 7.30pm the series culminates with a full evening concert with the Victoria Baroque Players, “Bach on Palm Sunday”. Victoria Baroque Players’ successful beginning- three concerts in eight months! In its first eight months of existence the Victoria Baroque Players has played three entire concerts, and if you ask me I would say that with each concert the ensemble has only gotten better. I sense there is quite a bit of buzz around this ensemble now, and I hope it will keep growing! Each concert has seemed like a journey of its own–in the process of putting everything together, starting with planning the programme, bringing the performers together, promoting, then rehearsing, and finally performing. I and David are the only people with the privilege of seeing and being part of every stage of this process. (We are still very small-scale and home-made in our organisation!) Before moving to Victoria I never dreamed of becoming a concert organiser of any sort or forming my own ensemble, but life can take unexpected turns, and here we are. Judging by the enthusiasm of the members of the ensemble and the audience, these concerts seem to be providing something that has been missing in Victoria before. The Victoria Baroque Players’ next concert ‘Bach on Palm Sunday’ is just around the corner, on April 1st 2012. I can guarantee another evening of exciting music and music making! Posted in Uncategorized	| Comments Off on Victoria Baroque Players’ successful beginning- three concerts in eight months! There is a nagging voice in my head that always questions everything I do. One of its favourite questions is: “Why are you doing music? Why should music be so important? Why should anyone listen? Why should music be taught in schools? !” The voice wouldn’t let me alone, so I finally wanted to give it a prompt answer. Music is the art of organised sound that happens in real time, the product of human imagination. Music is an nonverbal language that speaks straight to our emotions. Music moves and energises us, and can make us feel the full range of human emotions. And it is our feelings and the ability to feel that give our lives a sense of purpose. If one couldn’t feel and nothing felt like anything, surely life wouldn’t be worth living? In some ways, music can be like ‘concentrated life’; it can express the deepest mysteries of being a human. That is why it is so important that we have music in our lives and society, that we nurture and relish it and take the time to stop for a moment and listen. That is why it is crucial that we give every child the vocabulary for this marvellous language and expose all children to music. Music doesn’t belong only to professionals, but to everyone and every child should be given the opportunity and tools to explore and express themselves through music. Music connects us to other people: the people who are sharing it with us in the moment, and also the people who came before us and will come after us. Music that is hundreds of years old can still speaks to us today, as the very essence of the human condition does not change over time. Music can make us experience beauty and the presence of eternity. At its best, music can be a spiritual experience. We feel the presence of something bigger than us, whatever you like to call it, God, or truth. At the end of the day, beauty and truth are the same thing. Truth is beautiful, and everything that is beautiful, expresses truth at some level. That is why we should always aim for perfecting our art at the highest possible level (absolute perfection, of course, is never completely possible. Only ‘God’ is perfect, but we are invited to seek to be “perfect like God is”), to aim for clarity and beauty. And not just in music, but in everything in our lives. Before last year, I had practically zero singing experience. However, since I moved to Victoria, it has gradually become a big passion of mine. In the spring I was taken along to sing in a few groups around town, and the highlight of these first choral experiences was singing Durufle’s Requiem last summer. That piece had such a hard soprano part that I realised I would need to do some practice in order for my voice to manage it. As I started doing some personal singing practice – first time in my life – I noticed two things: a) my singing was improving and b) I really enjoyed it. I was hooked! When the Durufle concert was over, I longed to carry on my singing and developing it, but didn’t quite know how to go about it. I felt quite shy about this (I’m a flute player, not a singer! And voice is such a personal instrument as well), and it took me a further three months to find the courage to ask around about singing lessons. But I’m so glad I finally started taking lessons and got some professional advice! Obviously, my flute-playing background has been some advantage, as some things are similar with singing, especially breathing. It is still a completely different instrument. I am not a very patient person and would rather learn everything at once. But I had to accept that the voice cannot develop overnight. The muscles need time. One has to train one’s muscles so one can be consciously in control of them, and eventually get them to work automatically. In singing the instrument is inside one’s body, which creates an extra challenge, as one cannot see what one is doing. One has to learn to remember what doing things correctly feels like. Metaphors are a great help in this, and can be more effective than talking in technical terms. Much of the time the key is to learn to relax the muscles, and not to do any unnecessary work or movement. You need your throat, jaw and tongue as relaxed as possible for the voice to resonate freely. Listening to oneself carefully is also important. But as one can only hear how one’s own voice sounds like inside one’s head, the help of an outsider’s (in this case teacher’s) pair of ears is crucial! Then there are the words. It is one area instrumentalists almost never need to think about. I got to discover all this wonderful poetry that goes with the songs I am singing. I don’t miss the words when I play the flute, but I do get great satisfaction out of being able to communicate all these beautiful words and meanings through singing. But the words provide a challenge of their own: learning the correct pronunciation and being able to sing them clearly, still maintaining free resonance on all different letters. Repetition is the key for establishing any new skill, and there are no short cuts to this. Doing something once is not a quarantee one can repeat it again at any given time. It takes hundreds of repetitions for the muscles to learn something so it becomes automatic. Luckily I really enjoy the voice practising sessions with myself. Each day feels a little different: some days things seem easier than other days, the muscles or mind engage in different ways and the ear hears different things. I try to think that all these different days are needed in the process. Eventually, the goal is to gain such a control over one’s instrument, it becomes an integral part oneself and one’s expression. That whilst singing, one can solely focus on the music and the words, and the voice is an expressive and spontaneous instrument singing through you. As I am singing purely because of personal fascination and fulfilment, I wanted to make it clear to myself this is something I must never get worked up about (plus getting worked up can get in the way of learning and tighten the muscles). Starting the journey of learning a new skill is like planting a seed and nurturing it, getting to witness it grow and develop over time. However, one has to be humble; one can only do one’s best – the plant can only grow at its own speed, and might sometimes take surprising directions. My singing tree has certainly grown since I started. And I am quite fascinated by how one’s very own voice can change, grow and develop with time and training. One more exciting thing about singing: everyone’s instrument is unique, no two voices are the same. And when singing, one’s very own body is the instrument resonating. Singing just feels right and I am sure it releases some essential positive energy. I can’t quite understand how come everyone on this planet is not singing – it is after all the instrument everyone has! In England, the weeks leading to Easter are the busiest season for many musicians because of all the St John and Matthew Passions. But not here. As far as I know, this is the only Bach event in Victoria around then. Unfortunately, our forces couldn’t quite stretch to a Passion this year (but maybe in 2012..), but the Missa Brevis in A major, BWV 234 is a beautiful piece of music and deserves to be played and heard! (Bach wrote four of these shorter masses, also known as Lutheran Masses, which for some reason are rarely done, maybe because they are overshadowed by his grand B minor mass.) The instrumentation calls for two flutes and strings, which we could find fairly locally, and has some most beautiful textures in it. The singers are all locals; some choristers from St John’s church choir – including the beautiful voices of the choral scholars, who are also going to be some of our soloists- and a few extras from around. It’s not exactly a professional choir, but neither was Bach’s (his choristers were all young students). And when everyone puts their best efforts and intentions in, a new level can be reached and both performers and listeners get to share in a very special experience. Music is always greater than us, but we are very privileged to be instruments for the music to speak through us. Just spent a wonderful week playing with another flutist, Janet See, from Bainbridge Island (WA). This was the first time I got to play with another flute player on the West Coast. We had a great team for this concert: me, Janet, Nathan Whittaker on cello, and Margret Gries on harpsichord. I haven’t really worked with Janet before and have only known her for a few months, and she has 30 years or so more performing experience than me, but this project was another great example of how connecting through music goes beyond ages and background. Our collaboration felt completely seamless from the start, and we did not need to discuss any stylistic nuts and bolts. Which releases one’s energy completely to listening, spontaneity, musical interaction and enjoyment. Funnily enough, we discovered that this was the first time for both of us, that we played or had heard of a concert with this combination of instruments. I guess this programme would not work nearly as well on modern flutes, as the sound of the modern flute is so much more powerful and piercing and doesn’t blend the same way, and the sensuality can be lost in a buzz of two competing sounds. (Sorry if I sound judgemental!) Also, maybe even amongst the period instrument players, the flute players tend to be somewhat competitive by nature, and you don’t always find the kind of ‘equal partnership’ that this music calls for. Of course, this concert wouldn’t have been the same without the inspiring playing and support from Nathan and Margret. I believe our audience was also sold to this special sonority. I look forward to the next time working with Janet, Nathan and Margret! My two big ‘Victoria dates’ are now behind and both were extremely positive experiences! The first one, Aug 26th, was at St John the Divine Church, where my husband David is the organist, and we pretty much put this concert together ourselves. The programme consisted of two of Mozart’s Flute Quartets, C and D major, Beethoven’s Serenade and Haydn’s Divertimento in G major. 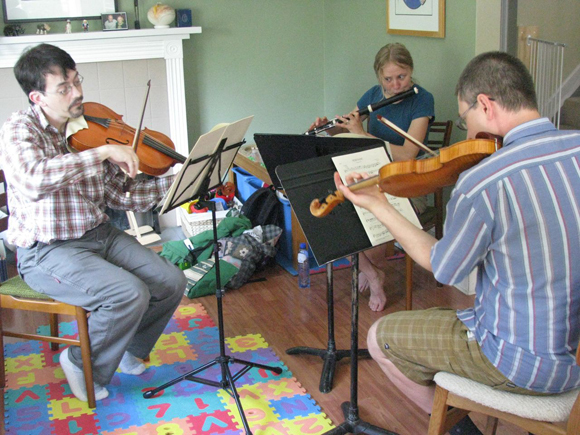 I was joined by three great strings players: Paul Luchkow, violin (from Vancouver), Steve Creswell, viola and Nathan Whittaker, cello (both from Seattle). I had never worked with any of them before, however, it seemed like we had done so for years, as the music making and communication between us seemed so natural and effortless. It always feels so magical and great when that happens! And hearing the comments from the members of the audience, as well as reading the critic published on the local classical music website, this enjoyment of playing together clearly communicated to the listeners too. Credits to Mozart, Beethoven and Haydn too: the music in this programme was so vivacious and effervescent, that it would bring a smile to anyone’s face. I certainly didn’t see anyone leaving frowning. Thank you so much Paul, Steve and Nathan for coming over to play this wonderful concert! I hope to have you all back here again soon! My next public appearance, on Sept 18th, was part of the Early Music Society of the Islands concert series (special thanks to James Young, who is behind these series). Through this concert, I had the pleasure to get to know and play with sopranos Nancy Argenta, Noemi Kiss, viol player Natalie Mackie and harpsichordist Valerie Weeks. The programme combined arias and cantatas by Carissimi, Couperin, Handel, Purcell and Scarlatti, as well as Handel’s Flute Sonata in C major and Couperin’s Premier Concert Royal, so I got some limelight myself, besides playing obbligato lines in the vocal works. I found the concept of this concert a little amusing, as all five of us were women, and the combination of two sopranos and a flute is just about as treble-heavy as you can go. No complaints though, everyone was lovely and I do love high notes! I always love the challenge of listening and matching when playing with other instrumentalists, and with singers this is especially interesting, as they are so much more theatrical about their performance. Keeps you on your toes and makes you grow as a musician: the life-time work-in-process! And flute is the closest instrument to the human-voice, as we all know! Also this concert got an extremely warm reception. I must admit I find the Victorian audiences very good listeners and very appreciative and enthusiastic! But not very mixed in age.. Any ideas on how to bring younger audiences to classical music concerts?! Encouraged by these experiences, I and David are planning to start proper concert series at St John’s Church. (with much focus on local musicians and early music – surprise, surprise.) I want people to think that there is a Great Early Music Party going on in Victoria and it’s the place of great music making!